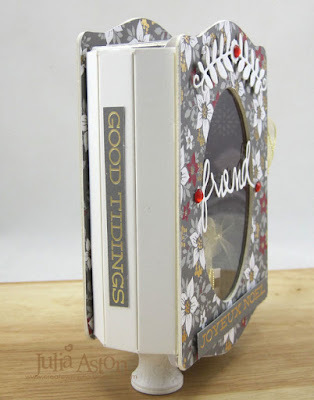 Today I'm sharing another project using one of Eileen Hull's new Book Club Sizzix dies - Card Box Planner and Storage Die. I also used her older Flower Heart and Soul die to decorate it. The Book Club dies will be available in December. 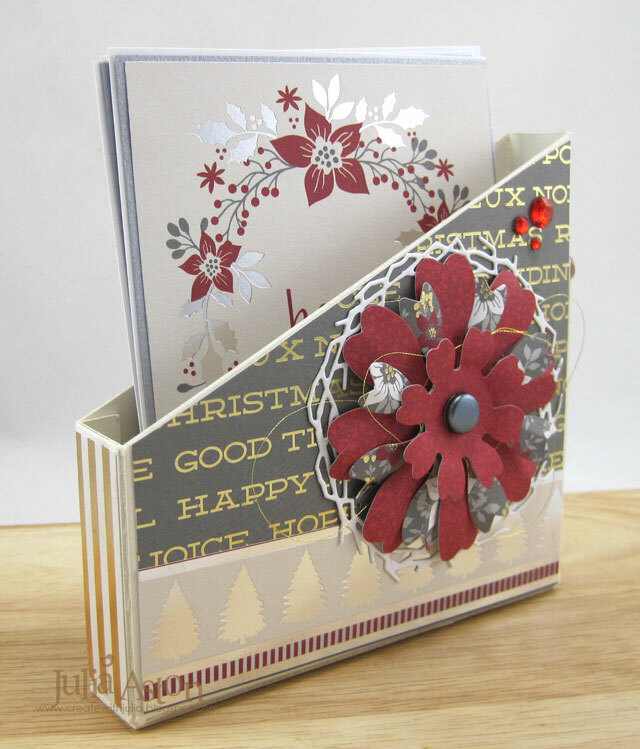 I made a folder to hold Christmas Cards - either ones I receive or to give a gift of cards to someone! This box measures 5 1/8" wide x 4 3/4" tall (on its tallest edge) x 1"deep. 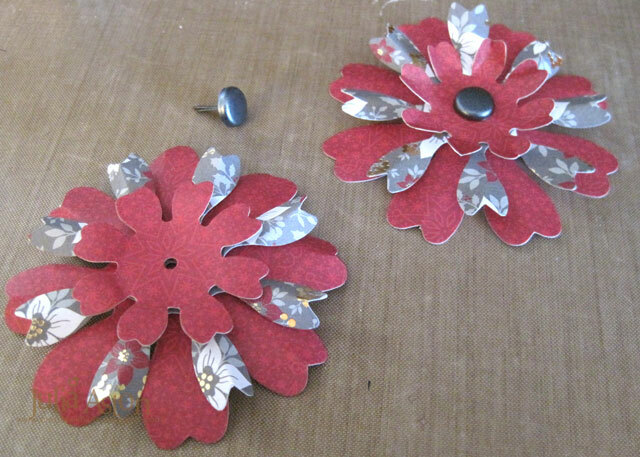 Here are the flowers I die cut and layered with foam dots between each layer and their petals curved up. All of the beautiful papers used on this project are from DCWV Cranberry Christmas Paper Pad. View of the back edge with the label from the die set. 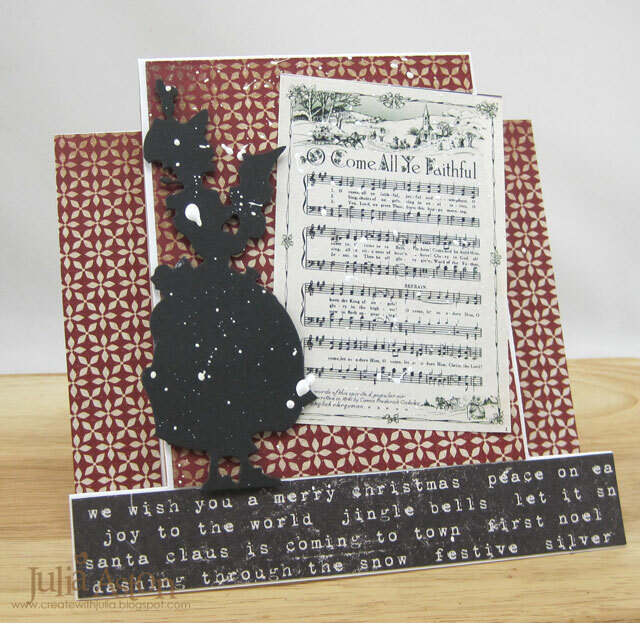 The greetings is cut from one of the patterned papers - it fit perfectly! I added red rhinestones, some gold thread looped around the flower and a die cut wreath behind the flowers. 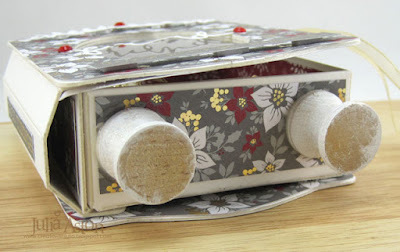 What would you use this fun Card Box Planner Storage die for??! You can buy it here in Decemer! 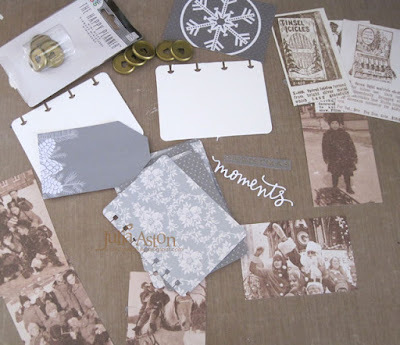 Please check out Eileen's blog where you will find several posts in November of the Inspiration Teams projects using these new Book Club Dies! Accessories: Card Box Planner Storage Die, Flower Heart and Soul Die - Eileen Hull/Sizzix, Grapevine Wreath Die - Memory Box, red rhinestones, foam dots, Black tie Brads - Bazzill Basics, gold thread from stash. Just a heads up that Bella Crafts Publishing is having a 50% off sale this weekend for these two e-books full of projects using Eileen Hull's Sizzix dies. When you purchase - the file will be sent to you in an e-mail so you can save it and access it at any time! 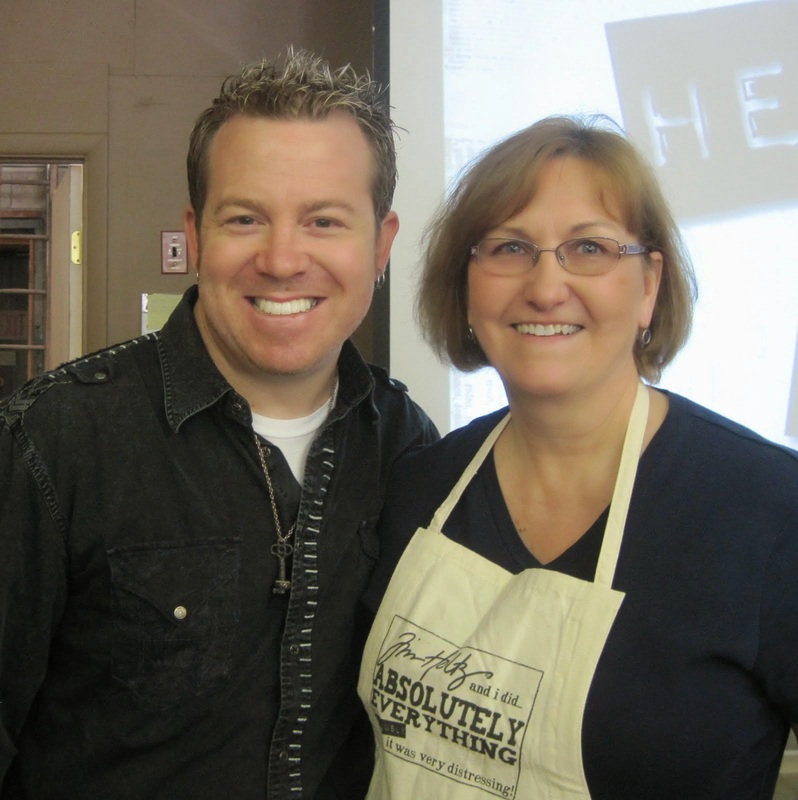 I have projects in both of them - whoo hoo!! (that's my NOTES journal on the cover and I have several more inside too! 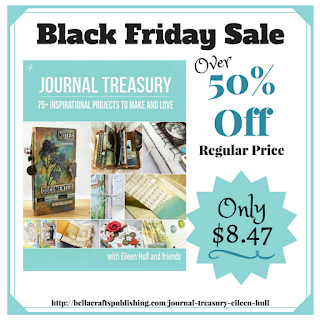 Half price is a great deal and it's available through Cyber Monday! Get yours before the sale is over! 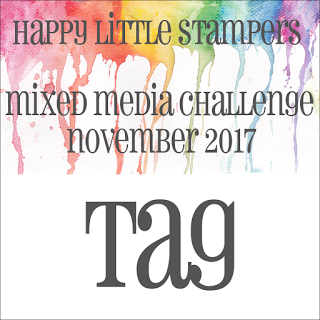 I'm just squeaking in to Loll's wonderful 12 Tags of Christmas Challenge - where she asks us to make a Christmas Mixed Media Tag - using stamping and at least two other medias. For my tag I used stamping, with embossing and sponging as my two other media. 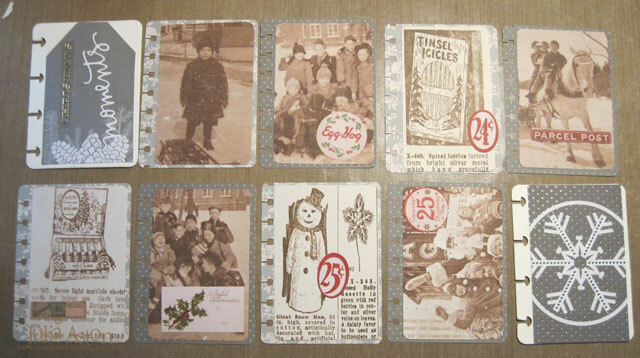 I used PTI's Folded Tag die along with Beautiful Berries: Winter stamps and dies. 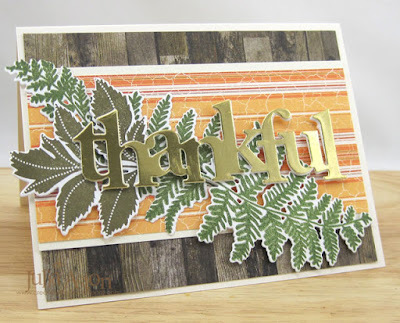 I embossed the top tag with Emerald Creek Allure Weathered Wood Embossing Powder and the sentiment in Ranger Gold Embossing Powder and I sponged all the edges with Ranger Distress Antique Linen Ink. I looped a piece of wrinkled seam tape through the hole at the top so it could be tied on to a package. 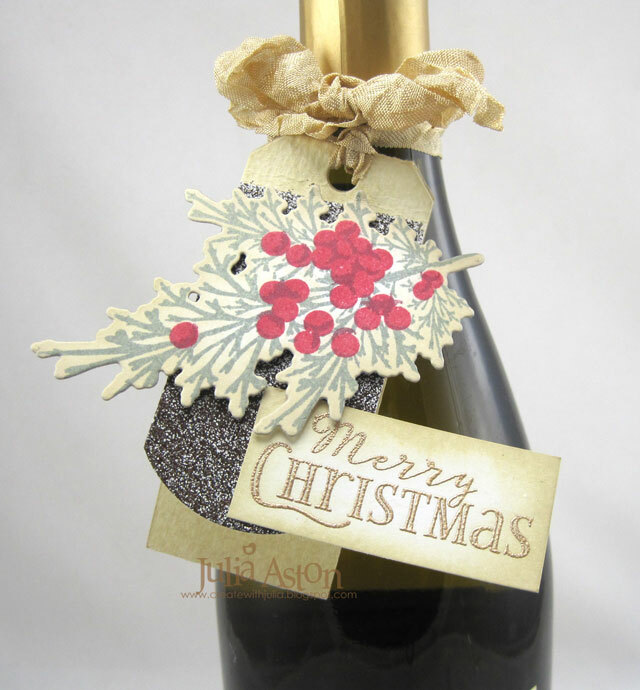 I think it dresses up a gift of bubbly quite nicely. 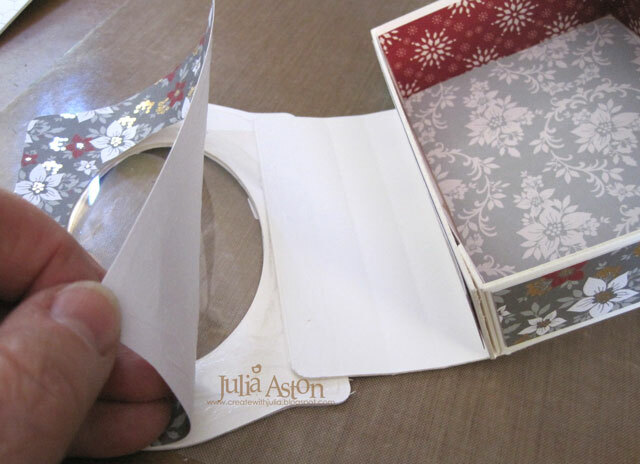 No further wrapping required! 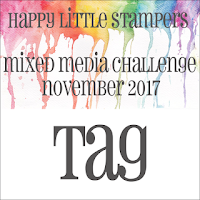 We have until the end of day on 11/24 to link up our mixed media tags - and there are prizes to be won - so please join in here at Loll's Blog! 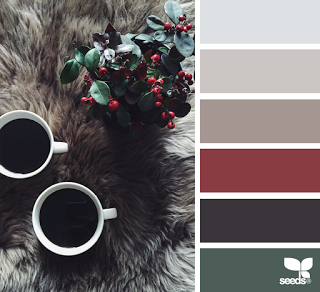 Ink: Stormy Sea, Scarlet Jewel, Pure Poppy - PTI, Ranger Distress Antique Linen, Versamark. 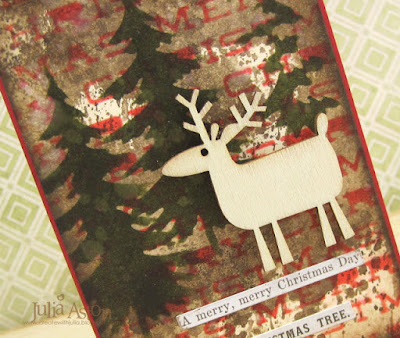 Accessories: Folded Tag Die and Beautiful Berries: Winter Die set - PTI, Emerald Creek Allure Weathered Wood Embossing Powder, Ranger Gold Embossing Powder. 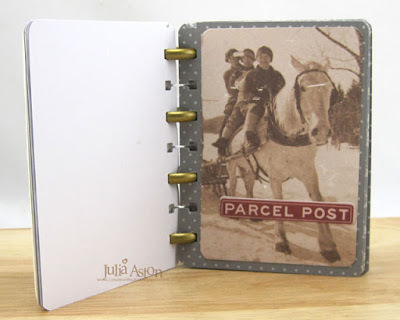 Today I'm sharing my third project using Eileen Hull's new Book Binding Movers and Shapers Magnetic Die. 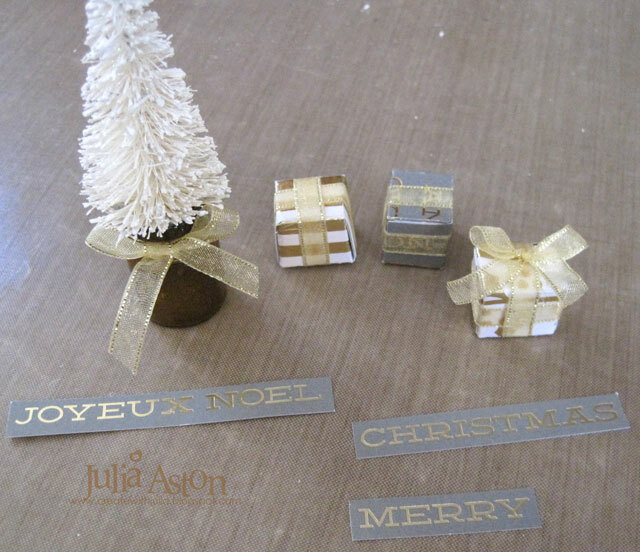 They will be available for purchase in December. I got all the pieces gathered to make my little photo book - I'm using vintage Christmas photos from the Idea-ology Merriment Paper Stash rather than real photos. 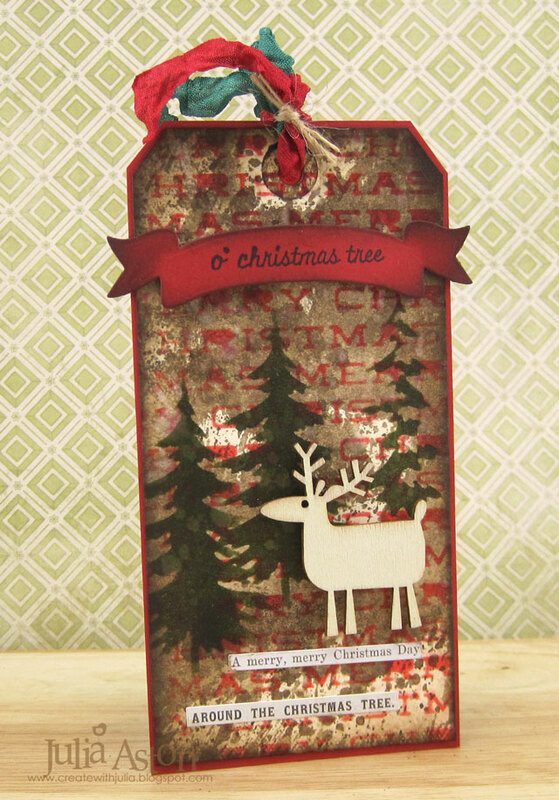 The patterned papers and tag on front are all from the DCWV Cranberry Christmas Paper Pad. The word 'moments' I used on the cover is die cut from the new Floral Arch and Words die set. I adhered all the photos to die cut paper pages. Here are all my pages and the two covers lined up in the order I wanted them. 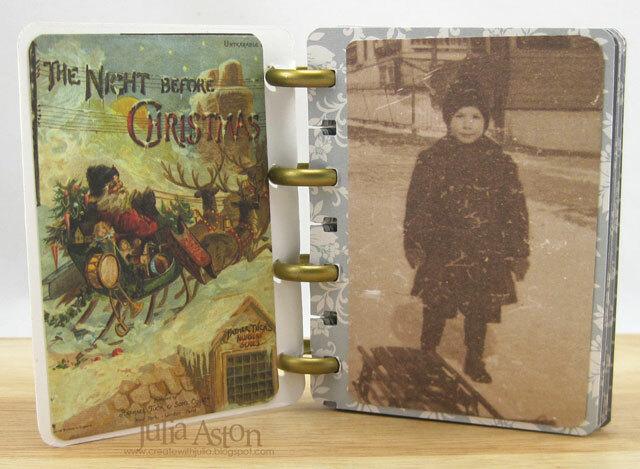 Disclaimer: Eileen sent me the die cut covers to make my book before the dies were available - so I used a notebook punch I had to punch the holes on the inside pages so there are more slots than the cover has - you would use the Eileen's die to cut your inner pages as well as the covers. I put them all together and pushed the Mini Discs into the slots. Here is the first page, and a couple of inside pages. The matboard is so sturdy these little books will stand up on their own for display! 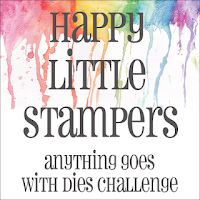 What kind of little book would you make?? 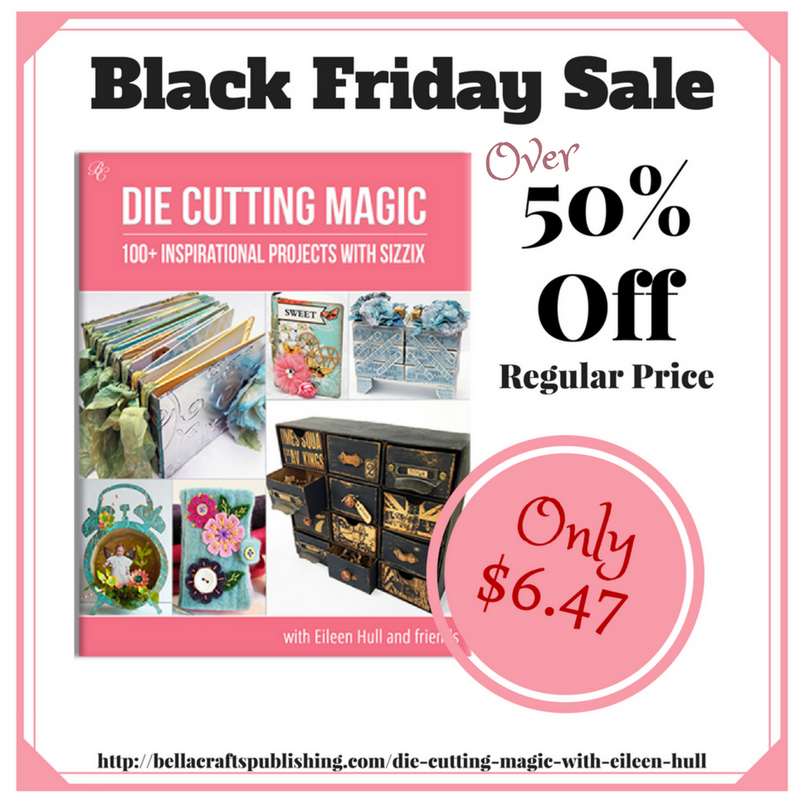 You will find this fun new Book Binding die here! 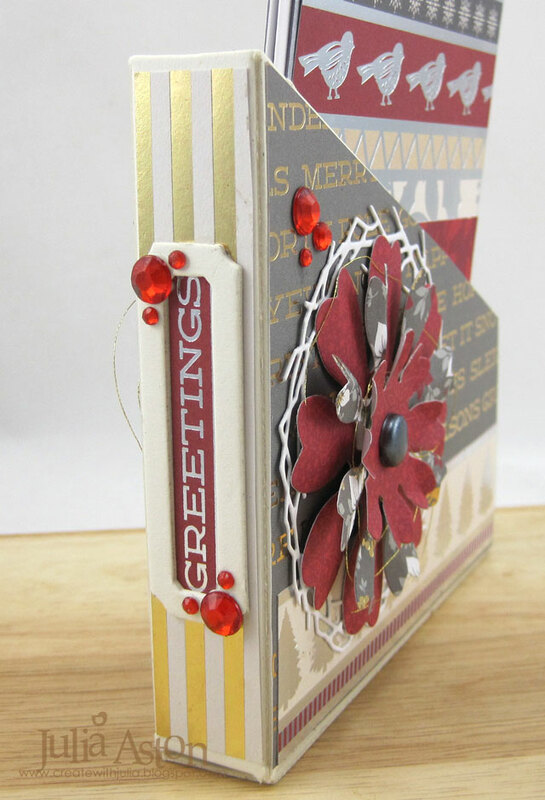 Eileen will be showcasing all of the creations by the Creative Team using her all of her new Book Club Dies on her blog each week in November. 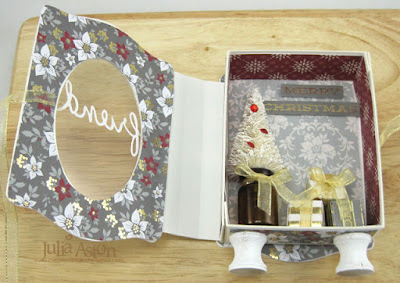 Paper: White Little Sizzles Matboard - Sizzix, DP DCWV Cranberry Christmas, Merriment Paper Stash - Tim Holtz/Idea-ology. 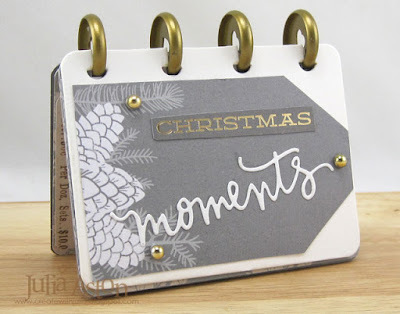 Accessories: Book Binding Movers and Shapers Magnetic Die, Floral Arch and Words - Eileen Hull/Sizzix, Mini Discs - Me and My Big Ideas, gold rhinestones, Zutter Corner Rounder, Ephemera Pack/Festive - Idea-ology. Mid Month November CAS Mix Up reminder! 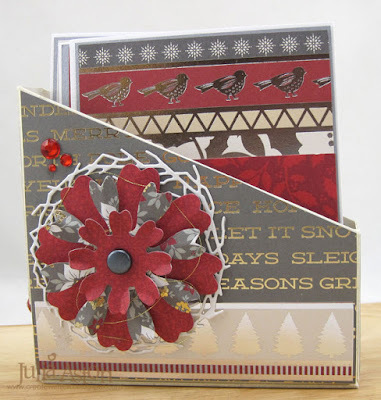 I'm here today with a card for and a reminder of the November CAS Mix Up Challenge! 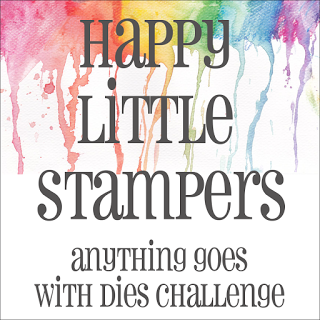 It's a fun one - Glitter! 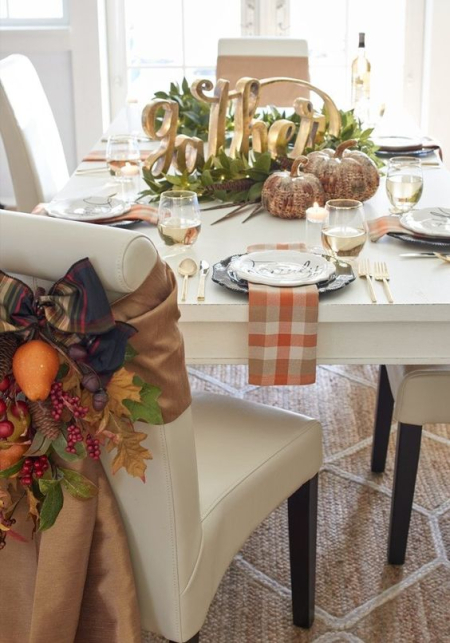 We could all use a little sparkle as winter approaches right?! For my card I used stamping, clear glitter brush, markers, die cuts and Glossy Accents. A birthday isn't complete without balloons right?! I die cut the balloons out of Bristol Smoothe Surface paper. I colored around the edges of one balloon at a time with a colored marker and blended the color over each balloon with my Wink of Stella Clear Glitter Brush. I did the same with the strings. 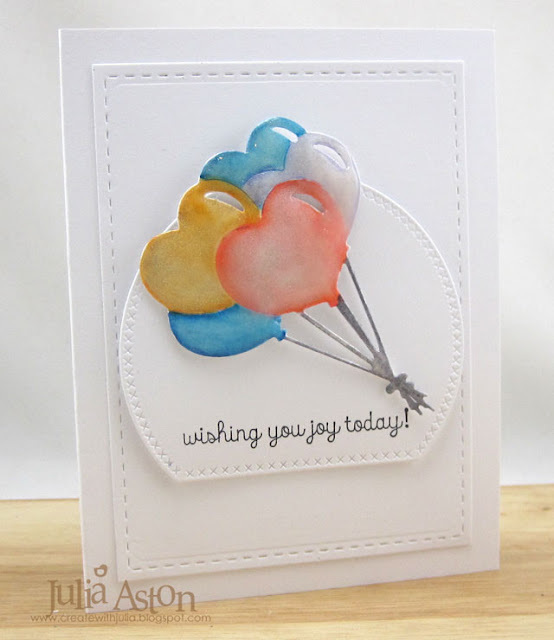 I used foam dots to layer the balloons over the flat bottom circle die. 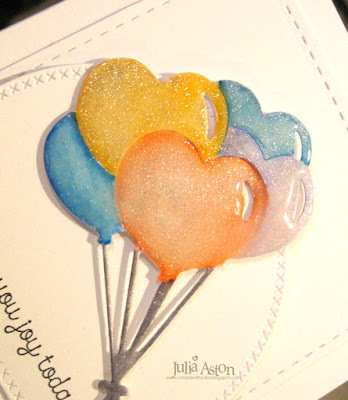 Then I added Glossy accents over the balloons for more sparkle and let it dry. 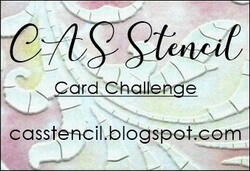 You have until 11/25 to link up your cards - check out all the details on the CAS Mix Up challenge blog here! 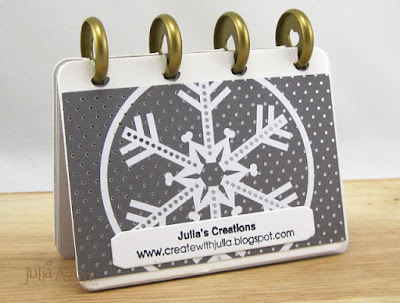 Accessories: Balloon and flat bottom circle dies - Ali Express, Stitched Mat Rectangle die - Lil Inkers Design, Tombow Markers, Wink of Stella Clear Glitter Brush - Zig Glossy Accents, foam dots. Here is my 2nd project using another one of Eileen Hull's new Sizzix Book Club Dies. 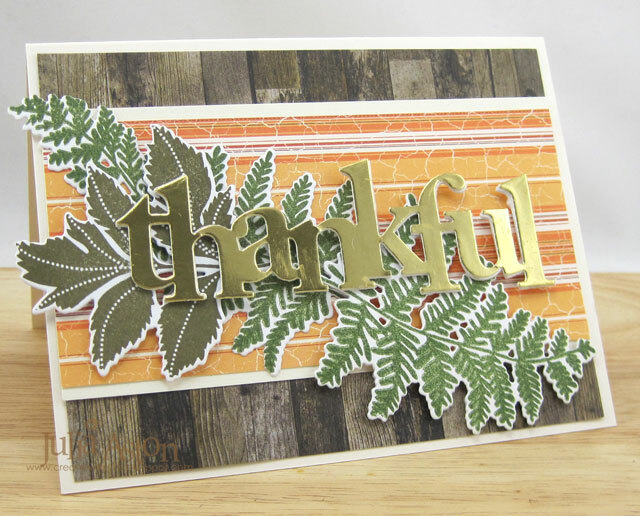 Each week for the month of November all of Eileen's Inspiration Team will be showing their projects with tutorials using these fun new dies! 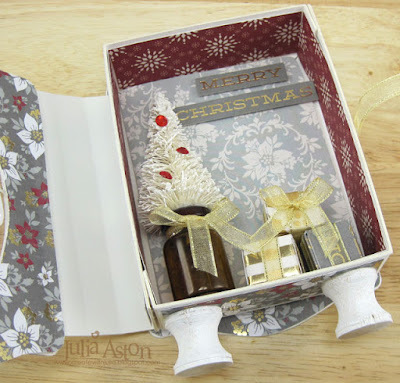 Today I'm using the Book and Pages Trinket Box and Frame Die. I also used the new Floral Arch and Words Dies. I made a Christmas Vignette inside of my Book Box! Here's the scene I created inside. 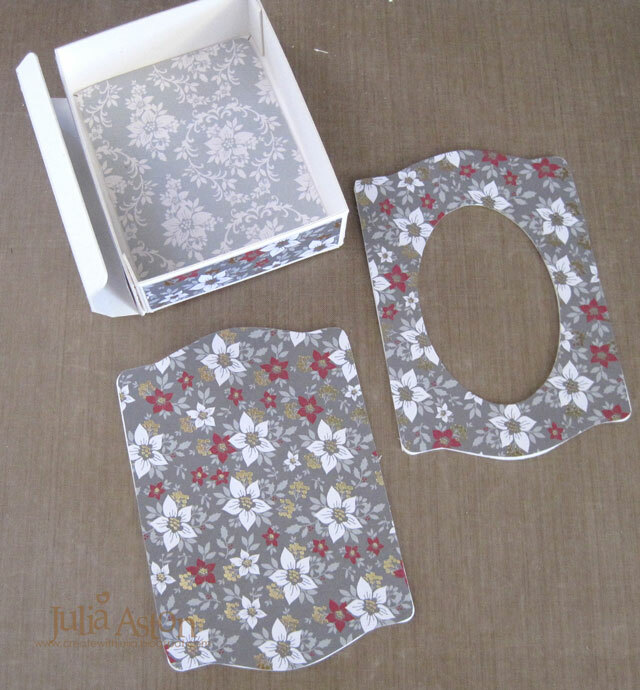 Below are some photos of the process of putting this together! 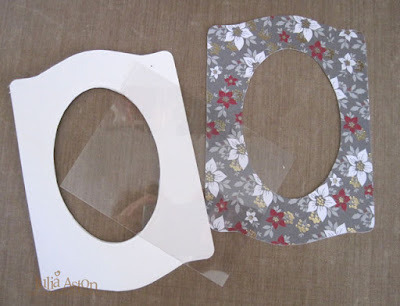 I die cut the pieces out of white mat board and patterned papers. 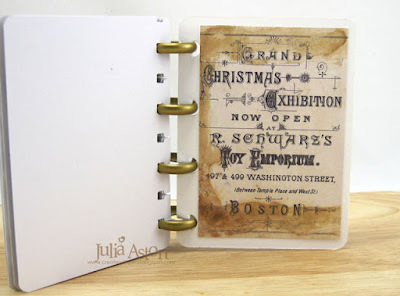 I added an acetate window added between the layers of the cover piece. Then I gathered items for the inside scene. Here's a photo showing how I attached the cover and box to the binding piece so it didn't show. I had these wooden spools in my stash and used them for legs so the book will stand up for display. 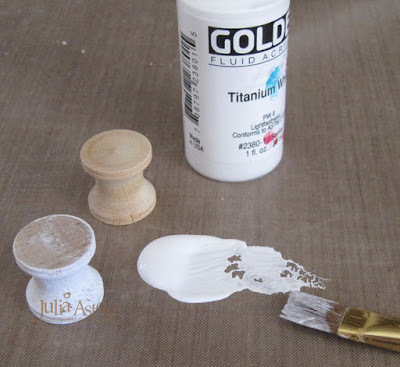 I painted them white with some acrylic paint. 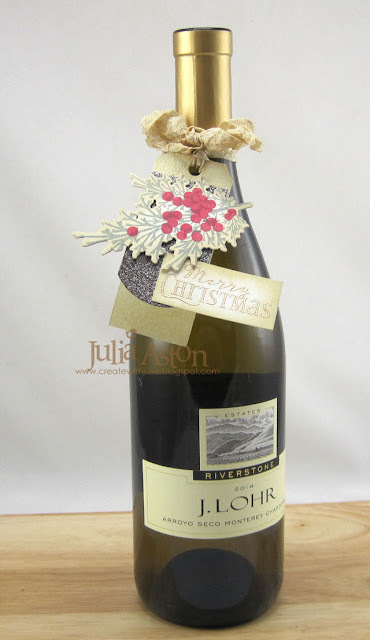 Inside decorations of a small bottle brush tree adhered to an apothecary bottle, gift boxes (made from a Papertrey Ink die from a Christmas set) and sentiment from patterned paper - all adhered with glue or foam dots, and red rhinestone ornaments added to tree. 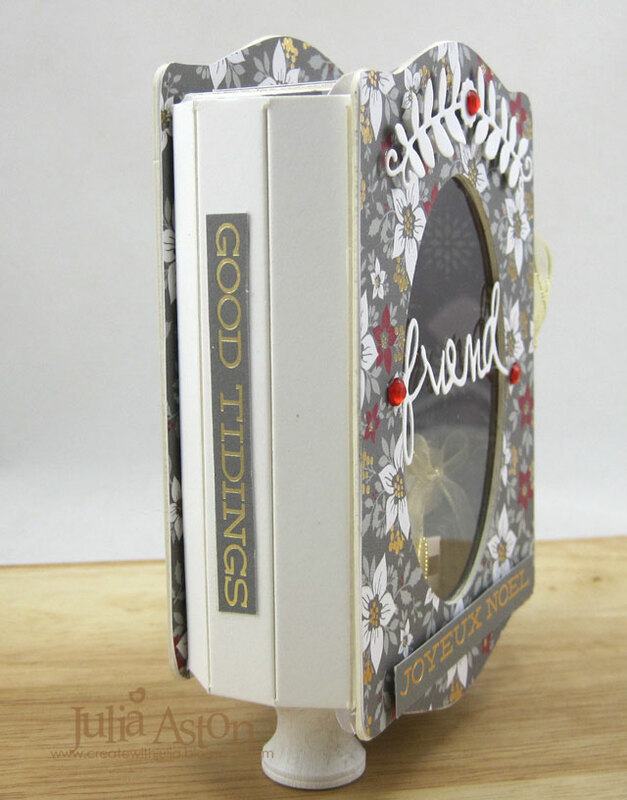 A view of the binding using a piece of the patterned paper that had text on it. I added ribbon so it can be tied closed - one piece adhered in between the cover layers and one on the side panel using ScorTape. Another open view showing the cover and inside. 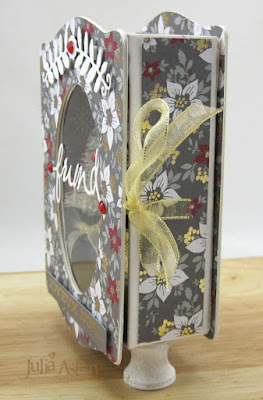 Finished view again - the floral arch and friend dies are from the new Floral Arch and Words set and coordinated perfectly with this book die! 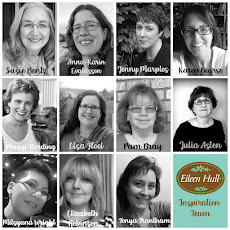 You'll find all the wonderful new Book Club dies here. 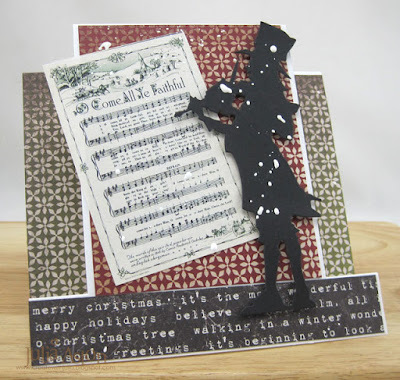 And please check out Eileen's blog each week in November where she will be posting all of the Creative Team's creations! Accessories: Book and Pages Trinket Box and Frame Die, Floral Arch and Words Die - Eileen Hull/Sizzix, little present box die from Make It Market Kit All Through the House - PTI, bottle brush tree - Joann, apothecary bottle - Idea-ology/Tim Holtz, ScorTape, 2 wooden spools, Tom Bow Glue, thin gold ribbon from stash, red rhinestones, foam dots, white acrylic paint. 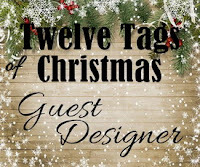 I was thrilled when Loll Thompson invited me to be a guest designer again this year for her wonderful Twelve Tags of Christmas event over on her blog Stamping with Loll. 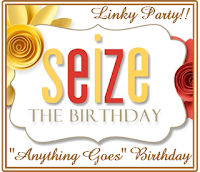 Her event runs from November 6th - 17th so we're a little bit more than half way through! 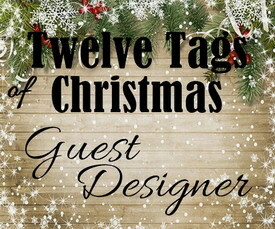 If you want some beautiful and creative ideas for Christmas tags - be sure to check it out! 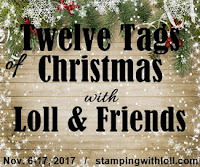 And now, without further ado - here is my tag for Loll's Twelve Tags of Christmas 2017! 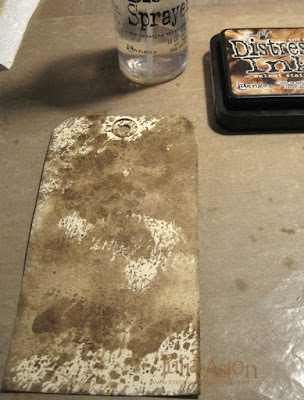 First I created the background by rubbing Ranger Distress Walnut Stain ink on my nonstick craft mat. I spritzed over the ink with water and then bounced the tag into the mix. I dried it with my heat tool and then tapped it in again to get more bead-like drops. 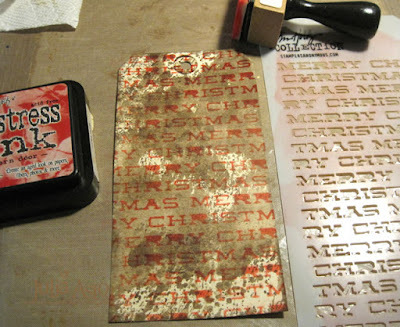 Then I stenciled over the background with Tim's Merry Christmas stencil using Barn Door Distress Ink. 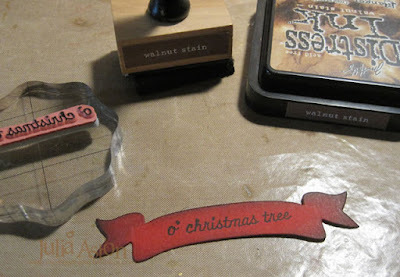 I put removable tape on the back of my tag to hold it on the mat while I sponged over the stencil. 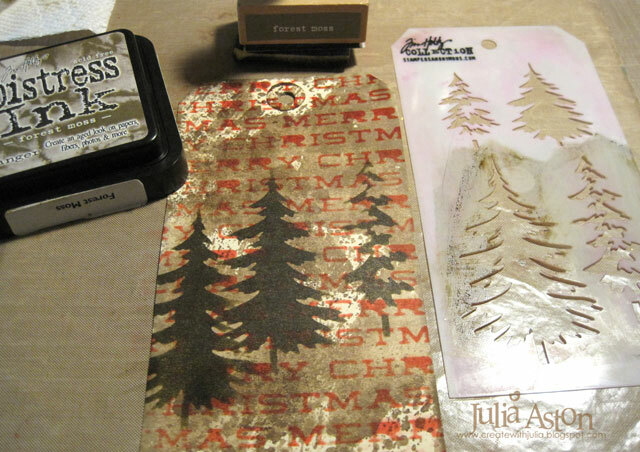 Then I got out Tim's Mini Pine stencil and decided where I wanted to put a few trees - and sponged them on over the text - using Forest Moss Distress Ink. I sponged the bigger tree on the left, then shifted the stencil and sponged the big tree again as well as the medium tree. I die cut a Ribbon banner out of red card, stamped it with a sentiment from Tim's new Watercolor Trees stamp set and sponged the edges of the banner with Walnut Stain Distress. I also sponged around my whole tag at this point with Walnut Stain Distress. I always layer my tags to a slightly larger colored piece that I just cut from cardstock and trim off the corners - here I used red. 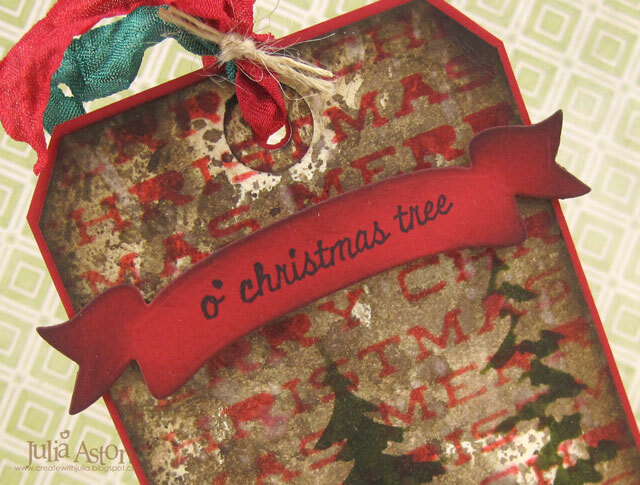 I like how it defines the tag - plus it covers up any mess created on the back with all the distress inks! I flicked water over the tag with my fingers to create water spots. You can see them on the trees here - you can also see how the trees DO actually look greenish in the right light! (I don't know where I got these critters - the bag has no company listed on it - maybe Hobby Lobby?) 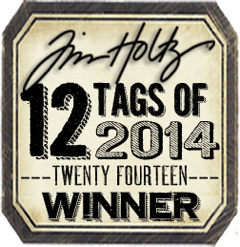 A adhered two Clippings Stickers/Christmas from Idea-ology on the bottom of my tag. So what kind of tags are you making for the holidays? 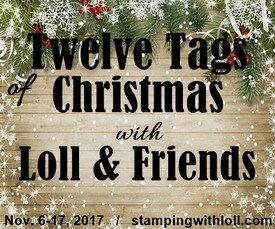 You will find my 2017 tag over at Loll's 12 Tags of Christmas post here. 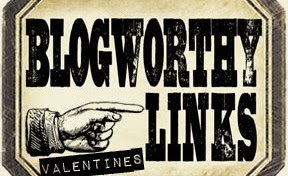 I'd love if you'd take a peek! The guidelines for Loll's challenge are that it must be a mixed media Christmas tag (any style / any size) which includes stamping, plus two mixed media elements (techniques or products). 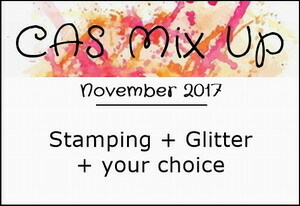 November CAS Mix Up Challenge - Glitter!